There are now more vacant apartments in Switzerland than ever before. Although these vacancies mainly affect rental apartments, the vacancy rate for owner-occupied property has likewise increased. This, however, is down to other factors. The number of vacant apartments is rising sharply again this year, and at 8,020 apartments the increase is the biggest in 20 years – as shown by the Credit Suisse Real Estate Monitor for the third quarter of 2018. 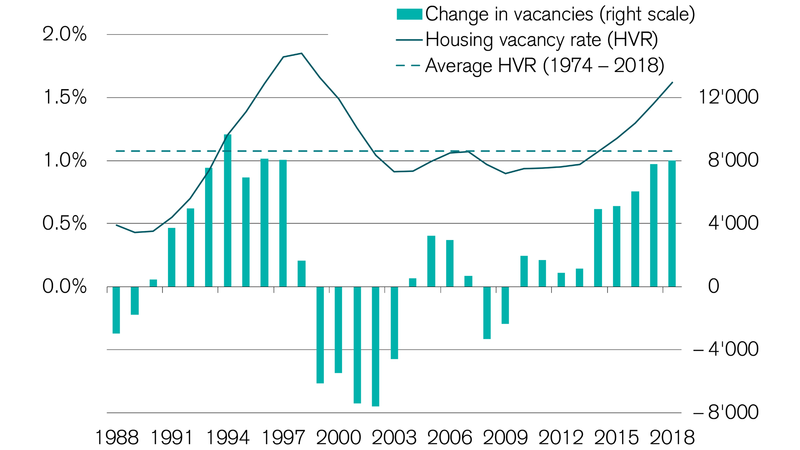 Overall, the number of vacancies has more than doubled over the last nine years. As of June 1 this year, it stood at 72,294 residential units – an absolute record. This pushed the vacancy rate up to a high 1.62%. 82.6% of the vacant properties are rental apartments. Here the vacancy rate has risen particularly sharply: from 2.24% to 2.51% in the space of 12 months. This is due to the continued surplus production of new homes, with more and more rental apartments being built despite a decline in immigration. The vacancy rate for owner-occupied properties is also rising – if at a significantly more modest pace. The vacancy rate for single-family dwellings has barely changed (from 0.41% to 0.43%), although we are seeing a slightly greater increase in the case of condominiums (from 0.87% to 0.94%). That equates to an increase of around 1,000 vacant apartments. This is a surprising figure, given that in contrast with the high level of building activity for rental apartments less owner-occupied property is being built. Here the number of building permits as well as planning applications is falling. The increase in vacancy rates for condominiums is explained by a significant drop in demand in some regions. This fall in demand is due to the high level of prices. At the same time, the financing requirements are substantial, and not everyone wanting a home of their own can afford a condominium. Find out more about the Swiss real estate market and the rise in prices for owner-occupied property in the Credit Suisse Real Estate Monitor. Read why prices can also be expected to increase further over the coming quarters, and in which regions the rise in prices has been particularly acute. Vacancies are likely to go on rising throughout Switzerland next year – if at a slightly slower pace. 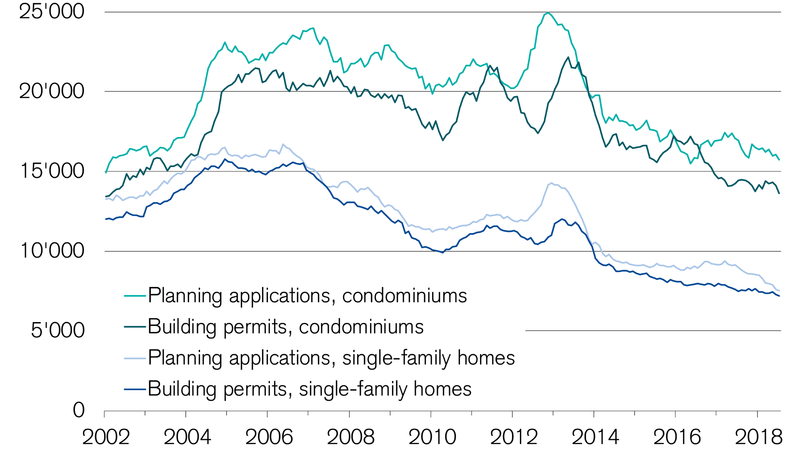 The latter is down to strong economic activity and a stabilization in immigration and building permits. However, there are no signs yet of any trend reversal. The project pipeline remains full to the brim, and the economic situation continues to underpin demand for real estate investment. The recent appreciation of the Swiss franc has also made it less likely that the Swiss National Bank will move away from negative interest rates – which indirectly stimulate construction activity – in the near future. Find out more about what this means for home buyers, investors, and tenants in the latest issue of the Credit Suisse Real Estate Monitor.